Playgroups are a great way for young children to have a lot of fun and for you to meet some local parents (who will have more tips on fun kid friendly things to do). Victoria has quite a few of them. As times and days change frequently, please check each website for times and days. The best, in my experience, are listed below. They offer 2 drop in’s; parent & tot (birth to 5), by donation and kindergym, (walking -5) and $2. Both fill up quickly so be there a few minutes early to ensure you get in! The Y is right downtown, and offers some drop-ins on Saturday mornings. The website is a bit hard to navigate, on the right hand side of the page you will see a blue box with drop-in schedules, click on ‘child’ to see what they have. Pearkes, Gordon Head, and Saanich Commonwealth all offer drop in Kindergym. To find information scroll to the bottom of page and click on Drop In Kindergym. If the Pearkes Kindergym fit’s into your day, it is located right behind Tillicum Mall, which is home to Old Navy, Winners, and Target…so you can combine your kindergym with a little shopping! Located in deep Oak Bay, this is a good sized kindergym, lots of ride ‘ems and sports stuff, and sometimes a bouncy castle. Usually they fill up so it’s good to go early to ensure a spot. Article courtesy of Lhasa Hetherington. 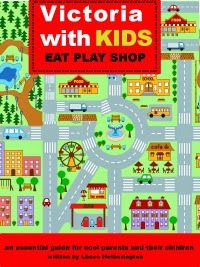 For more information, visit www.victoriawithkids.com. A copy of the book can be purchased at www.smashwords.com.